The flash of green and bare alloy emerges from a London side street. The rider, black visor down, looks both ways, and accelerates into a gap in front of a red bus. The bike is obscured by traffic. There is only the bus’s burp of diesel smoke and a question left to consider: Was that really a Kawasaki KR750? It had the bubble screen, the Gary Nixon/Erv Kanemoto paint and distinctive up-turned tailpiece. But something wasn’t quite right. It didn’t sound like a schizophrenic big-bore, two-stroke triple. Nope, definitely not. 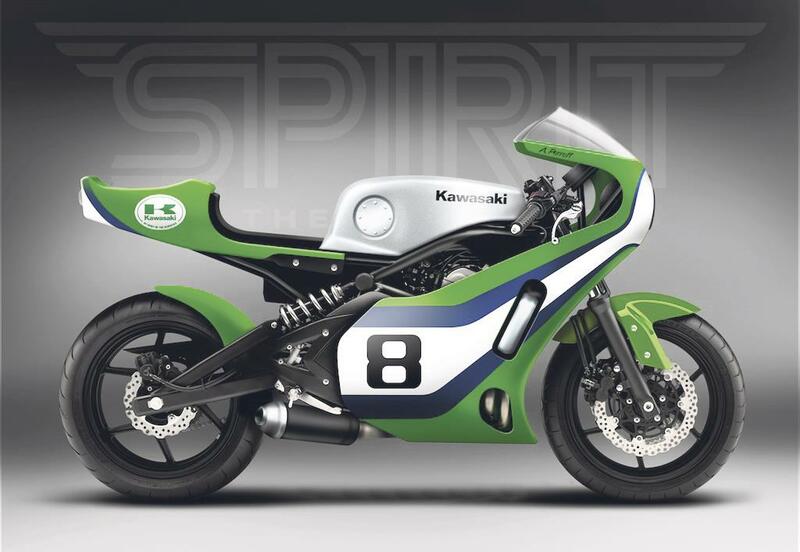 The truth is Aaron Perrott’s tribute to the famous two-stroke raced at the TT by Mick Grant, and in the Formula 750 Championship by Gary Nixon, is also a product of Kawasaki Heavy Industries, but a relatively humble ER-6f. After seeing a Kawasaki W800 customised by UK custom company Spirit of the Seventies, Aaron entrusted his daily-ride 650cc twin to the Kent-based customisers. 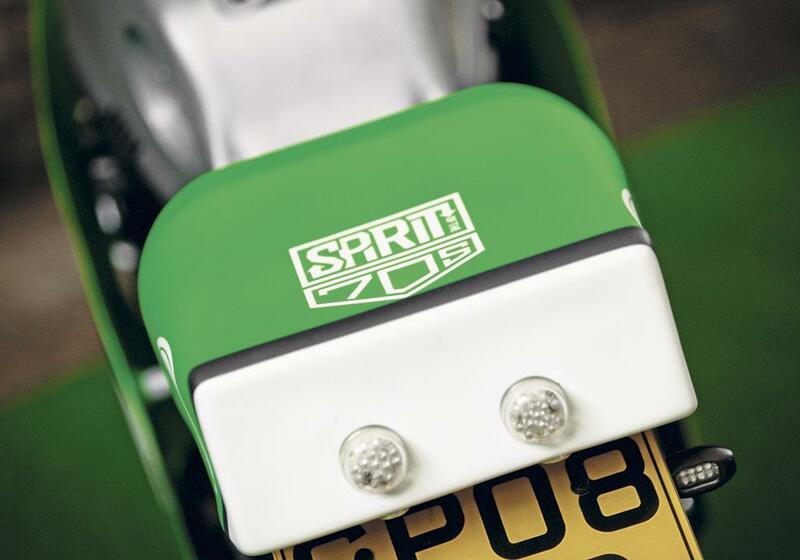 It was Spirit’s Tim Rogers and Kev Taggart who suggested it should be converted in a KR750 style, but the bike’s owner laid down some very specific guidelines. “I didn’t want to change the chassis at all,” Aaron explains. That meant Spirit couldn’t remove a single bracket from the frame, normally one of the first jobs of any build. With that water-tight brief, the transformation they’ve made is even more astonishing. The ER-6 first won fans for being a no-nonsense commuter with style and enough buzz to raise it above the opposition. 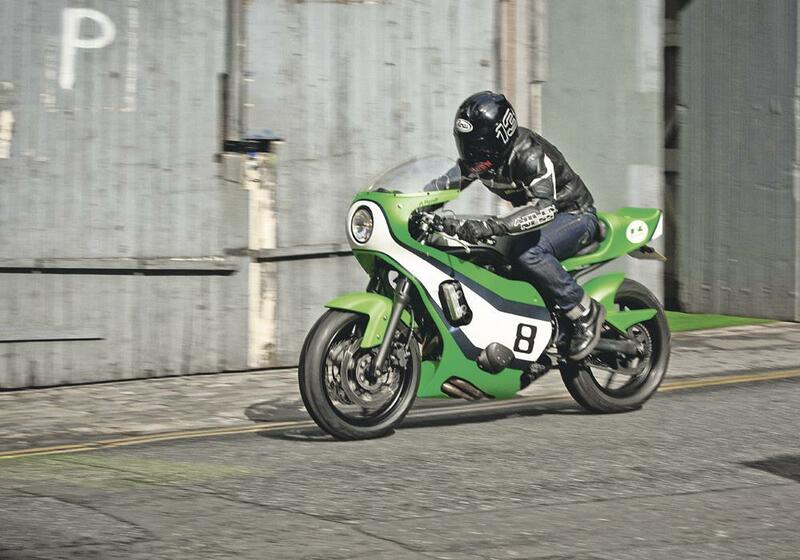 It then gained extra credibility when Irish real road racing legend Ryan Farquhar proved the middleweight Kawasaki made a blistering North West 200 and TT bike in Supertwin trim. Tuners in the UK and USA regularly praise the 650’s very modern head and combustion chamber design and the cassette-style gearbox. 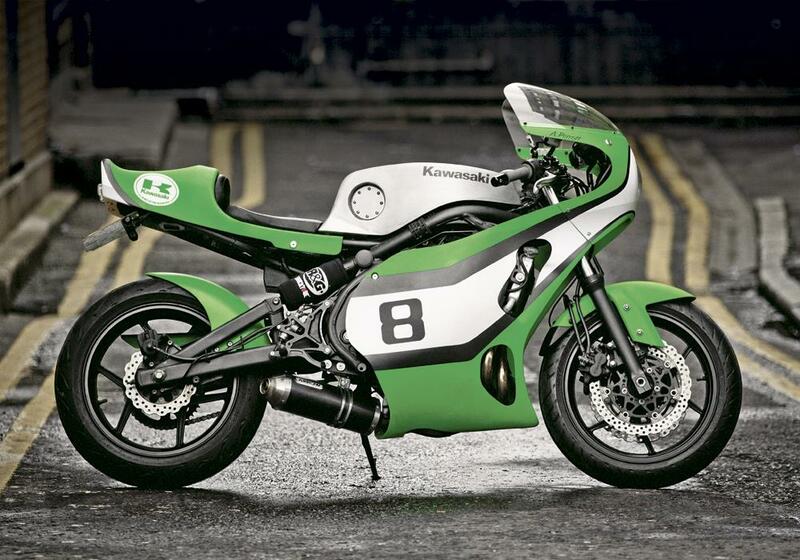 So, while it’s not exactly a sheep in wolf’s clothing, it was still a big ask to make a 2008 four-stroke twin road bike look like a 1975 two-stroke racer. 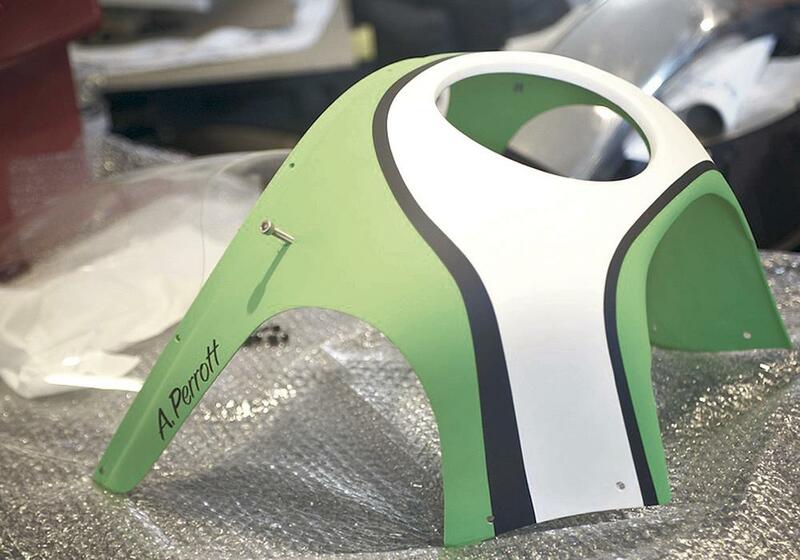 pirit used their connections to find a suitable fairing without having to invest in having a replica KR750 bodykit made from scratch. They found a mould of an old Bimota race fairing. They are tight-lipped about the exact model (a 1981 KB2?). 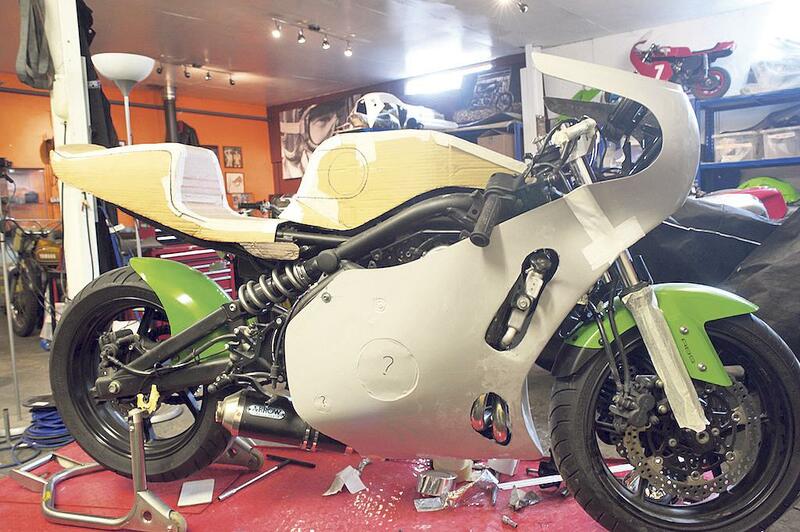 The fairing was cut to allow the radiator and exhaust headers to clear the fibreglass. The bubble screen was made as a one-off by UK specialists Skidmarx. The seat, that I would have bet my house on being a KR750 pattern part, is actually a modified Suzuki TR750, another monster two-stroke factory racer from the mid-1970s. The fibreglass seat has been widened and cut about, because, again, Aaron didn’t want the subframe modifying in any way. Spirit’s design whizz Kev knew it needed a new tank to be a really successful project and pushed Aaron to go the extra mile. In the end the owner, a 37-year-old IT expert, agreed and now admits it’s the making of the project, though it took a lot of financial commitment. “Think of a number and double it,” Kev says when I ask him how much it cost. People who can, and are willing to, make this quality of tank are few and far between in modern Britain. Spirit ended up contacting a vintage car bodywork specialist, the details of whom they’re keeping under their hats. 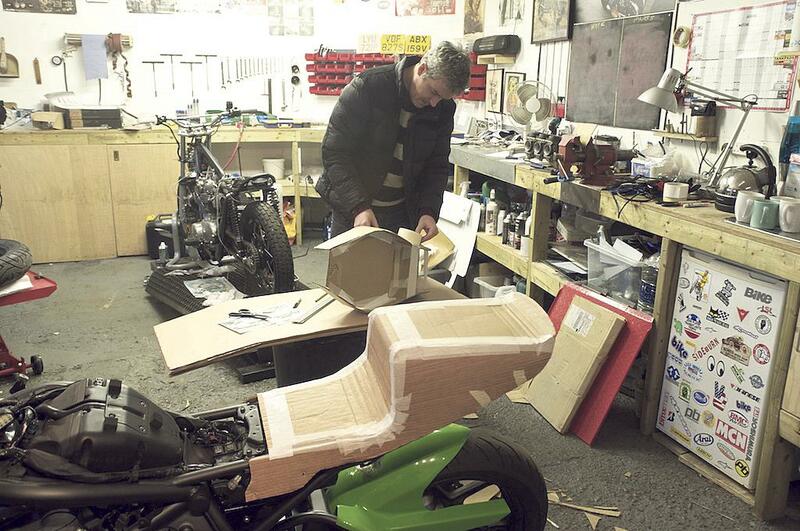 This is his first ever motorcycle tank and it’s a lovely job. 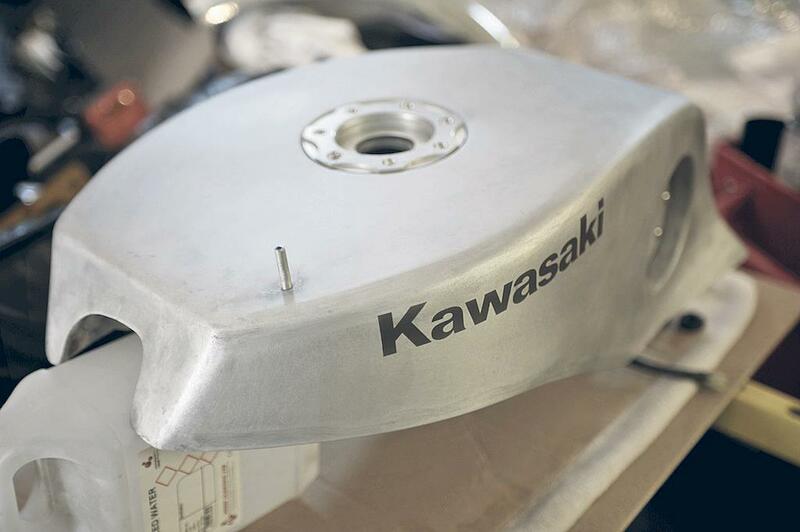 It even has the quick-filler blanking plate in the side featured on some 1970s Daytona 200 bikes – like Nixon’s KR750. 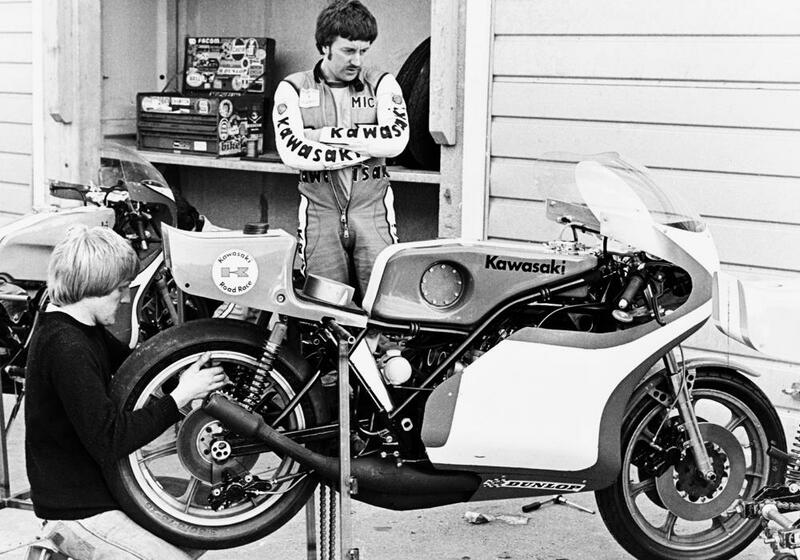 But where the 1970s race bike had a painted tank, it seemed sacrilege to cover the workmanship, so the hand-beaten alloy was left bare. This is, after all, an homage to the racer, not a replica. One element that Aaron thought was a dead giveaway that his street racer was once a common-or-garden ER-6 was the distinctive side-mount monoshock unit, so he and Spirit came up with the idea of disguising it with an R&G Shocktube. Spirit don’t rely on any particular company when it comes to bolt-on parts, instead choosing what is appropriate for each bike. 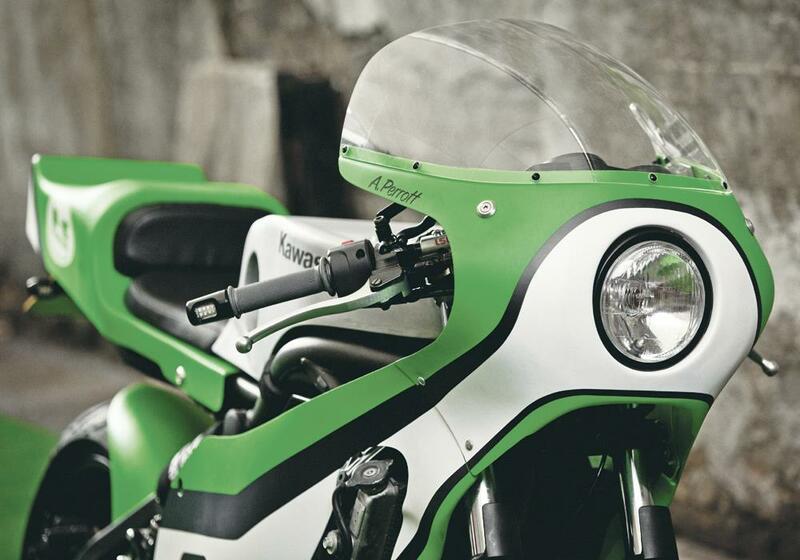 For this Kawasaki the list includes Italian ValterMoto rearsets and LSL clip-ons with Oberon bar-end indicators. The only engine mod is the Arrow exhaust system. The paint is something completely new to me: a matt, almost rubberised finish laid on by D-Luck of Brighton. Apparently, the finish is attained by spraying at low pressures. It’s also tricky to keep clean, reckons Aaron, the matt finish acting like a magnet for greasy fingerprints. It does look gorgeous up close. The Spirit of the Seventies logo on the tailpiece is a clever take on the old Heuer timing systems logo, while the number 8 on the side is Aaron’s old race number from when he used to compete in enduros. 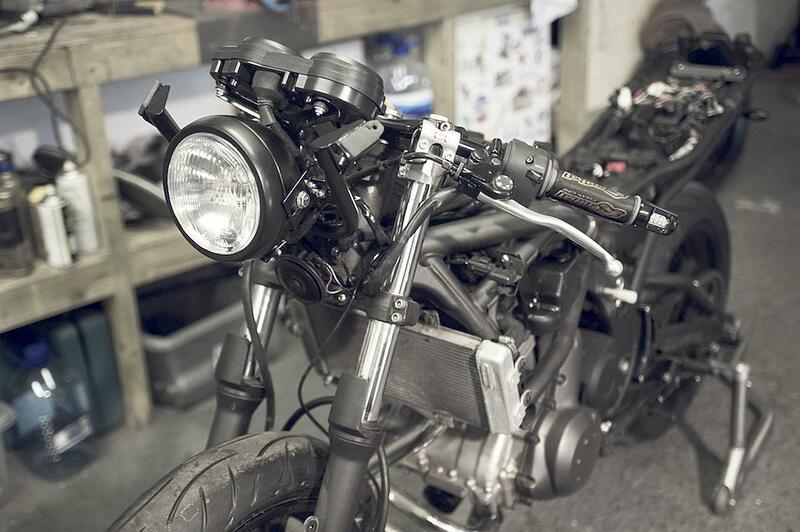 Aaron spent over £10,000 on the transformation, but the bike retains completely standard cycle parts. The wheels, brakes and suspension are just the same as the bike left the factory with. You could look at that two ways: Kawasaki know what they’re doing, so if this is a daily or regular rider then stick to that and you can’t go wrong; on the other hand you could say the donor bike was conceived as a budget bike and the suspension was the weak point of the package from day one. Aaron’s happy enough with it, and was determined that the whole make-over would be reversible, so the Kawasaki could be returned to standard in a day, without welding. We’re astonished how radical the bike looks considering those constraints. On my short road test, it was pure feelgood. The performance is identical to standard with an exhaust that has more bark than standard, but still isn’t antisocial. 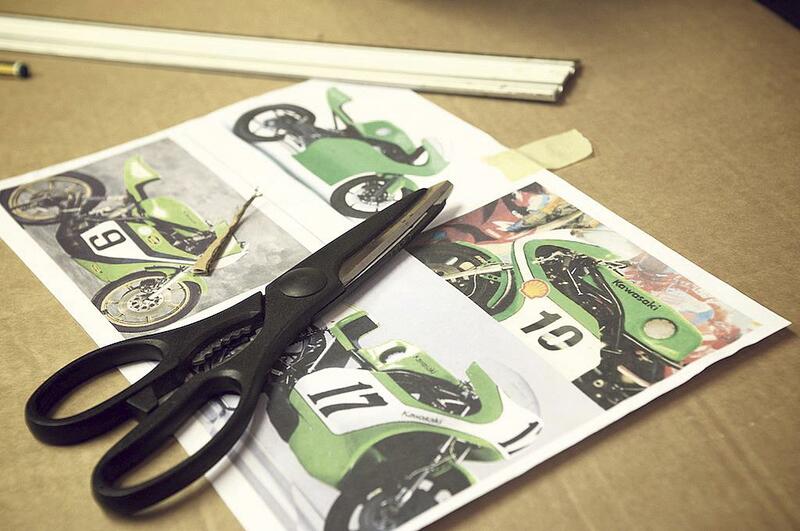 If you’re coming from a Ninja 250 the bike is a beast, if you’ve just climbed off a ZX-10R – it’s limp.